Pumpkin soup is one of those all-time favorite recipes that everyone loves to make. But, pumpkin can be pretty bland on its own. It definitely needs a few herbs and spices to spice it up. This pumpkin soup recipe has been spiced with some ground ginger and bouquet garni, which is just a bunch of herbs, either in a muslin bag or tied together. It’s then given a more subtle flavor lift with orange zest and lemon juice. The flavors are not overpowering and the result is a creamy, delicious soup. 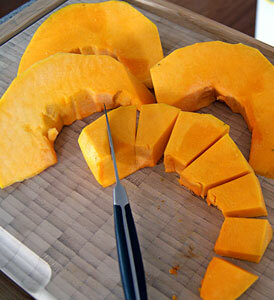 Peel the pumpkin, remove the seeds and cut into 1 inch cubes. Slice the onion and crush the garlic. Melt the margarine in a large heavy-based saucepan. Add the onion and garlic and cook over a low heat until the onion is soft but not brown. 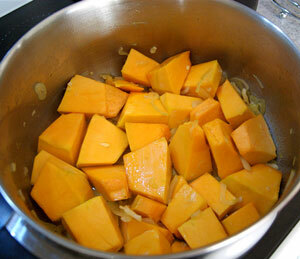 Add the pumpkin to the pan and cook with the onion for a further 2 – 3 minutes. Use a paring knife to cut 3 – 4 thin strips of orange zest. Add the stock and bring to the boil over a medium heat. Then add the ginger, lemon juice, strips of orange zest and bouquet garni. Season to taste. Reduce the heat, cover and simmer over a low heat for about 20 minutes. Remove the pan from the stove and discard the orange zest and bouquet garni. Make sure you remove all of the orange zest. Allow the soup to cool slightly, then spoon the soup into the bowl of a food processor and process until the soup is pureed. You will need to do this in several batches. 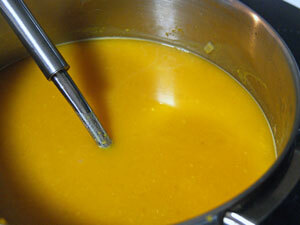 Pour the soup into a clean saucepan and return to the stove. Add the milk and gently reheat the soup while stirring, making sure it doesn’t boil or burn. Test the soup for taste and season again if necessary. 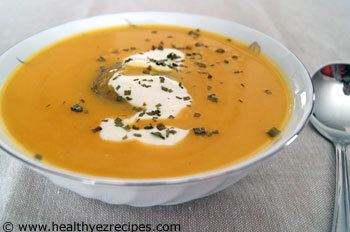 To serve spoon the pumpkin soup into a serving bowl and garnish with a swirl of natural yogurt and snipped chives.